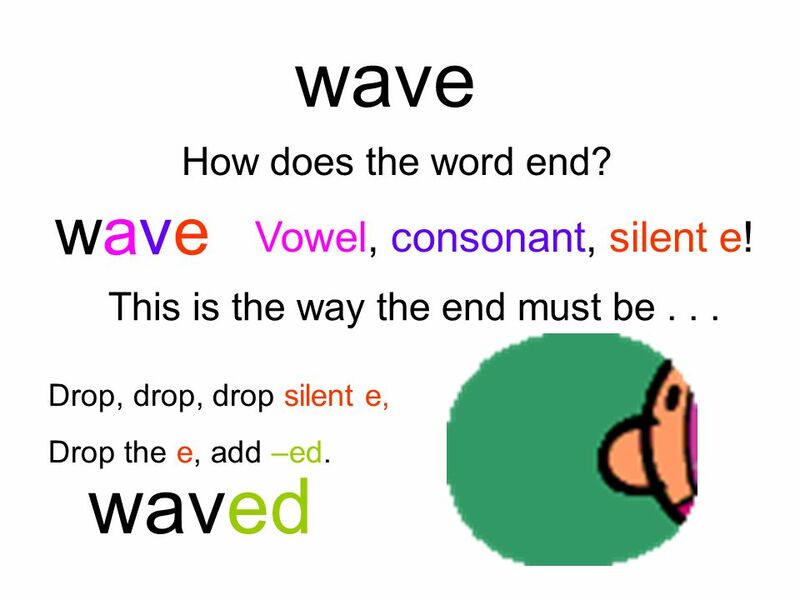 2 wave waved wave Vowel, consonant, silent e! How does the word end? 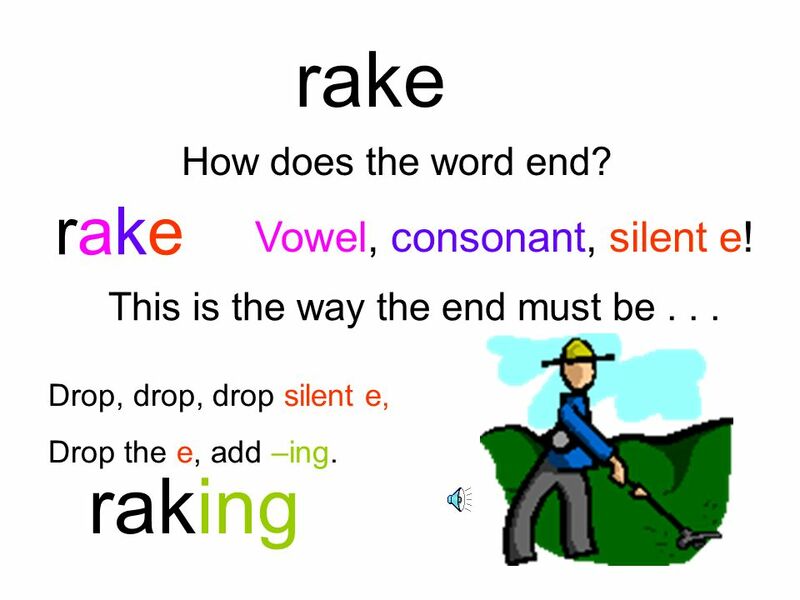 3 rake raking rake Vowel, consonant, silent e! How does the word end? 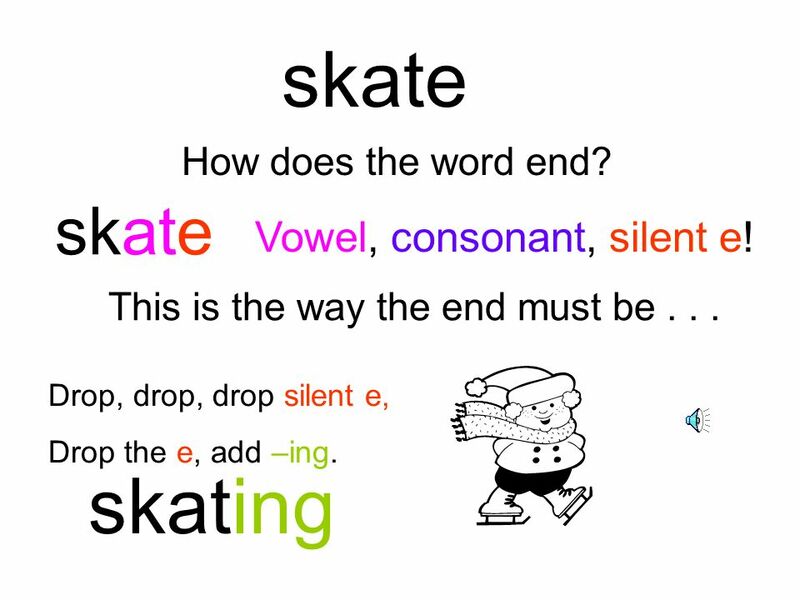 4 skate skating skate Vowel, consonant, silent e! How does the word end? 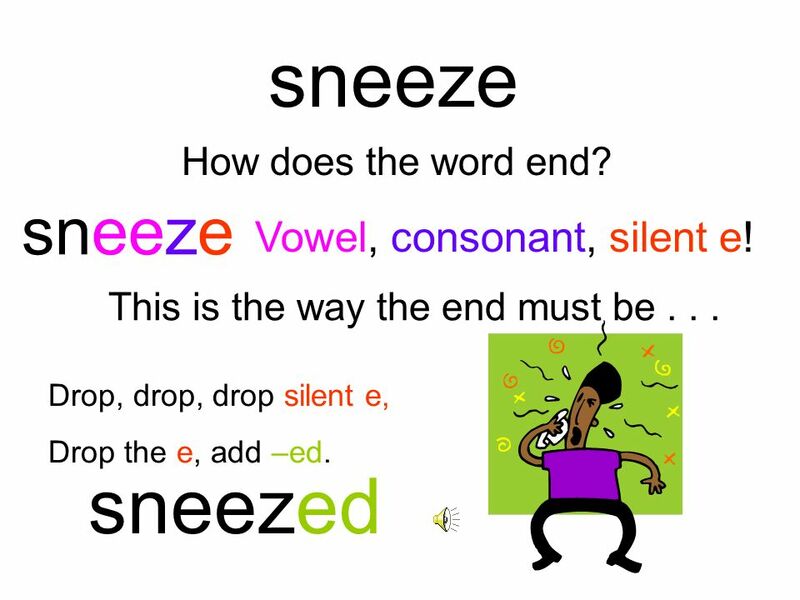 5 sneeze sneezed sneeze Vowel, consonant, silent e! 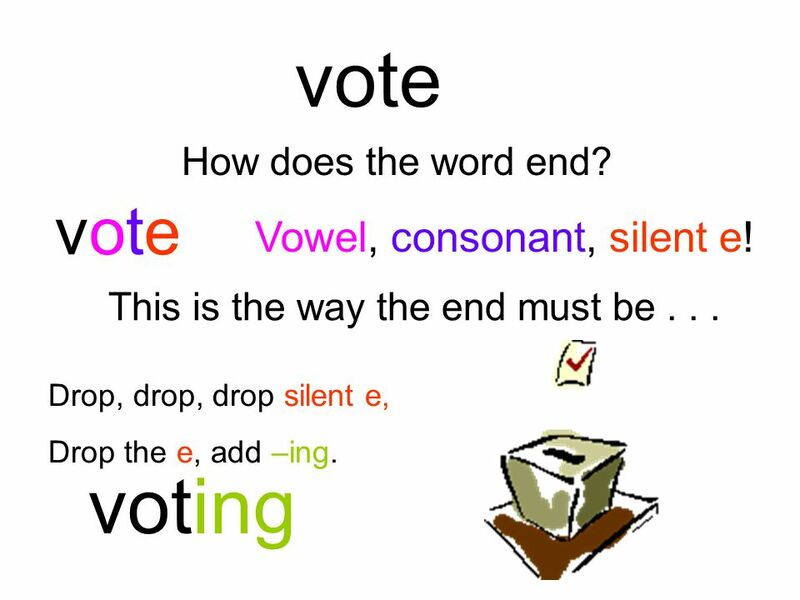 6 vote voting vote Vowel, consonant, silent e! How does the word end? 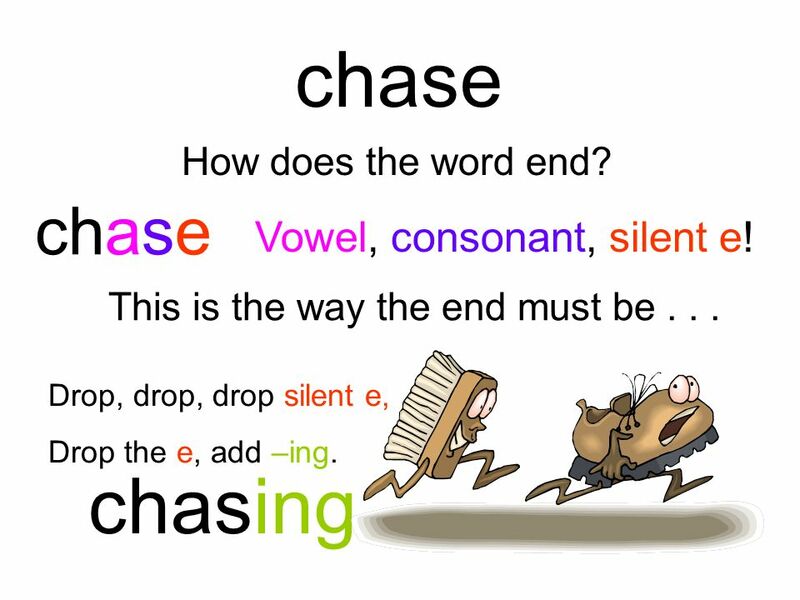 7 chase chasing chase Vowel, consonant, silent e! How does the word end? 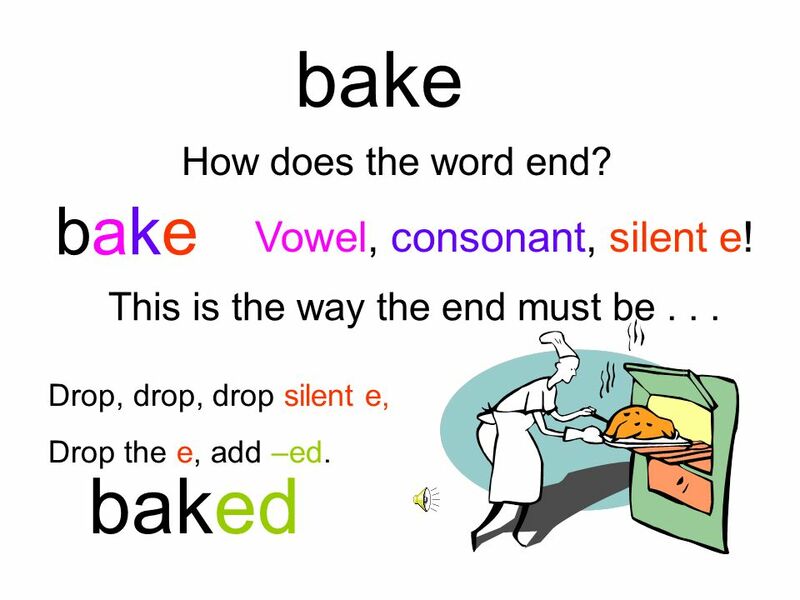 8 bake baked bake Vowel, consonant, silent e! How does the word end? 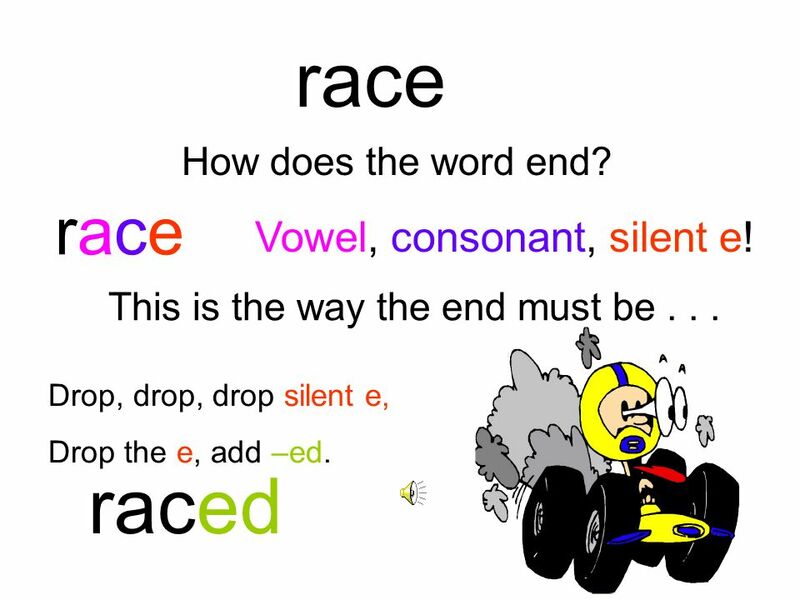 9 race raced race Vowel, consonant, silent e! How does the word end? 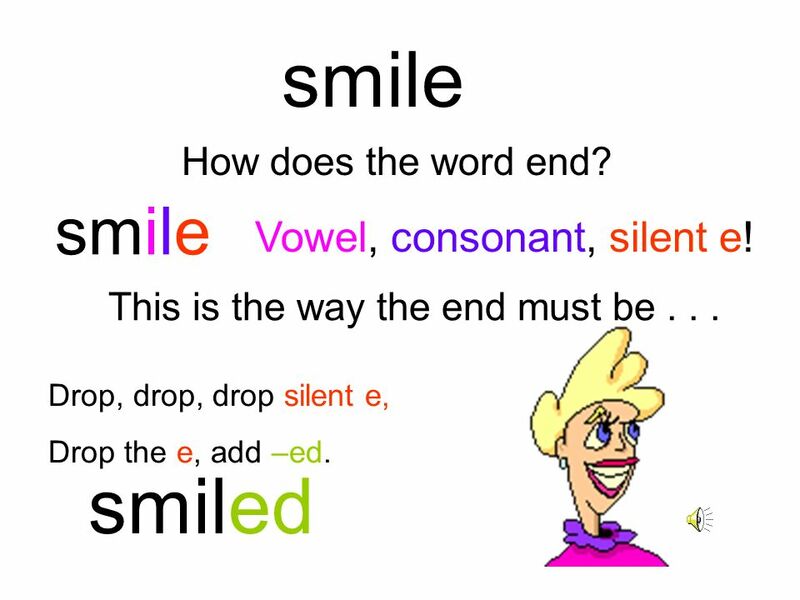 10 smile smiled smile Vowel, consonant, silent e! How does the word end? 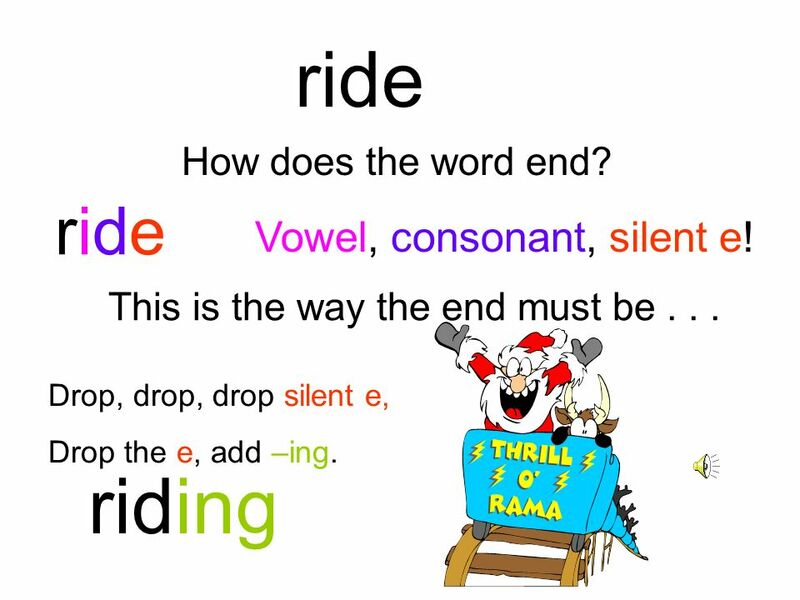 11 ride riding ride Vowel, consonant, silent e! How does the word end? 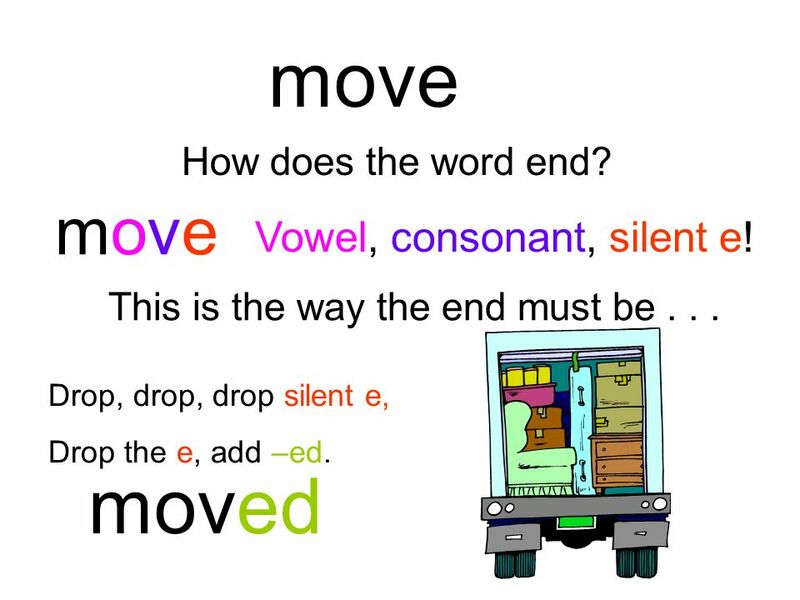 12 move moved move Vowel, consonant, silent e! How does the word end? 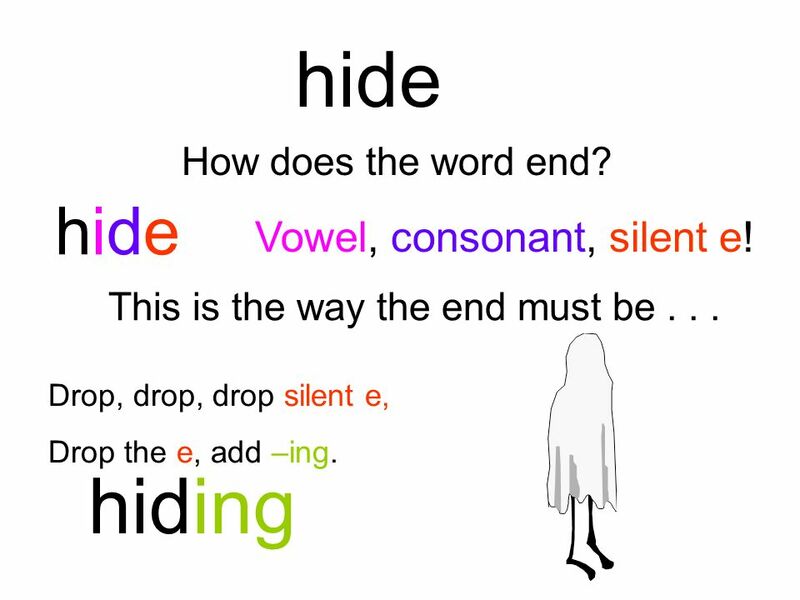 13 hide hiding hide Vowel, consonant, silent e! How does the word end? 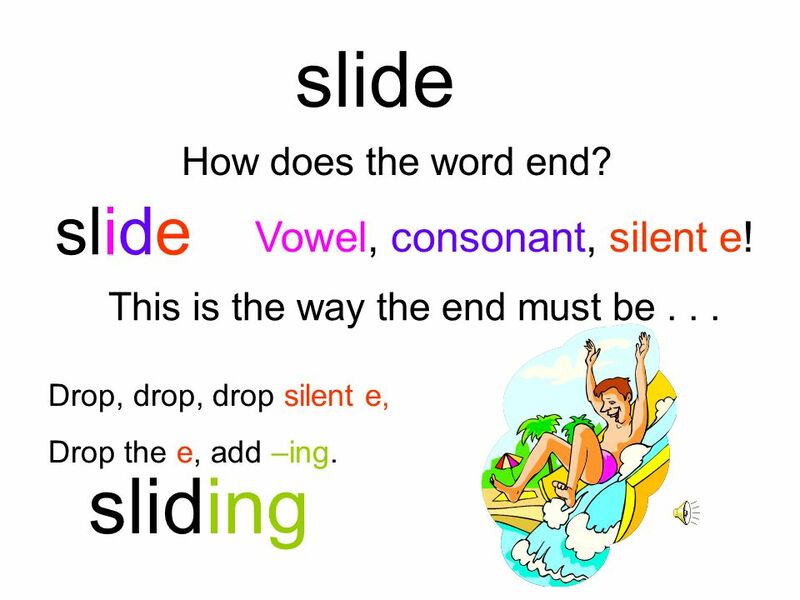 14 slide sliding slide Vowel, consonant, silent e! How does the word end? 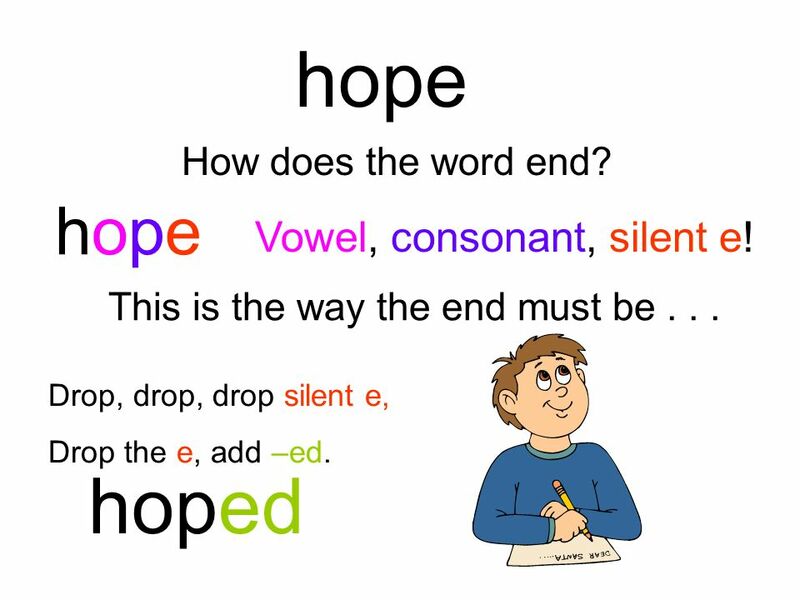 15 hope hoped hope Vowel, consonant, silent e! How does the word end? 16 like liked like Vowel, consonant, silent e! How does the word end? 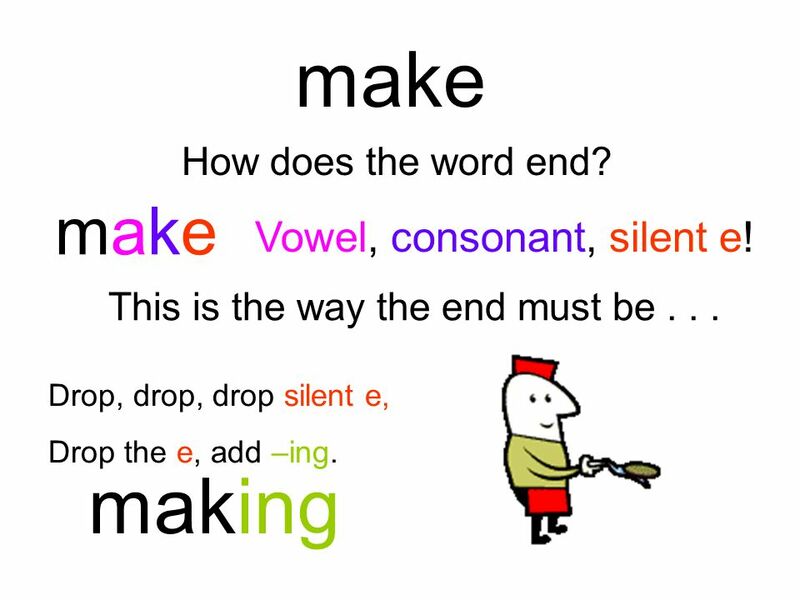 17 make making make Vowel, consonant, silent e! How does the word end? 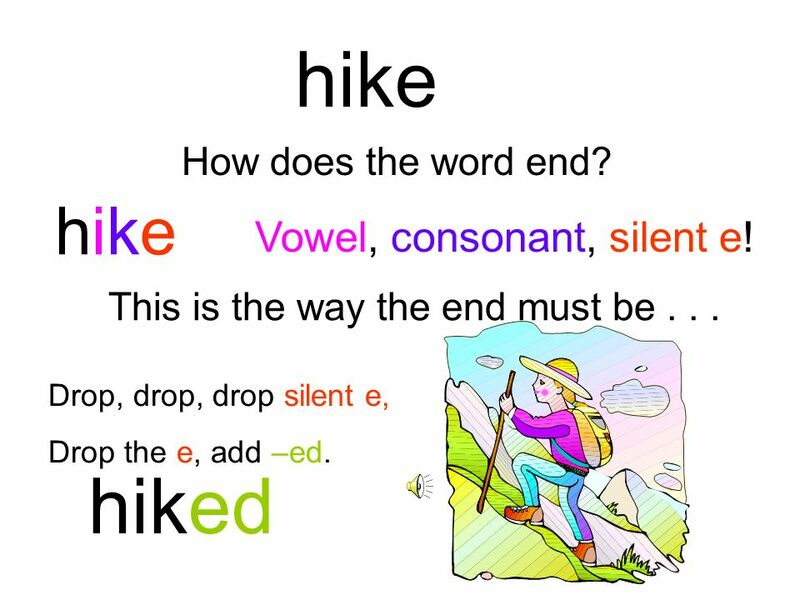 18 hike hiked hike Vowel, consonant, silent e! How does the word end? 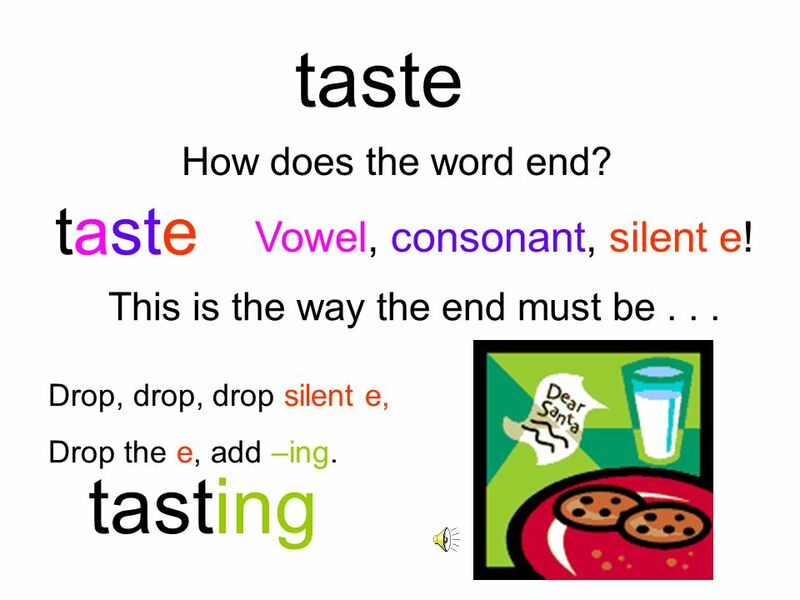 19 taste tasting taste Vowel, consonant, silent e! How does the word end? 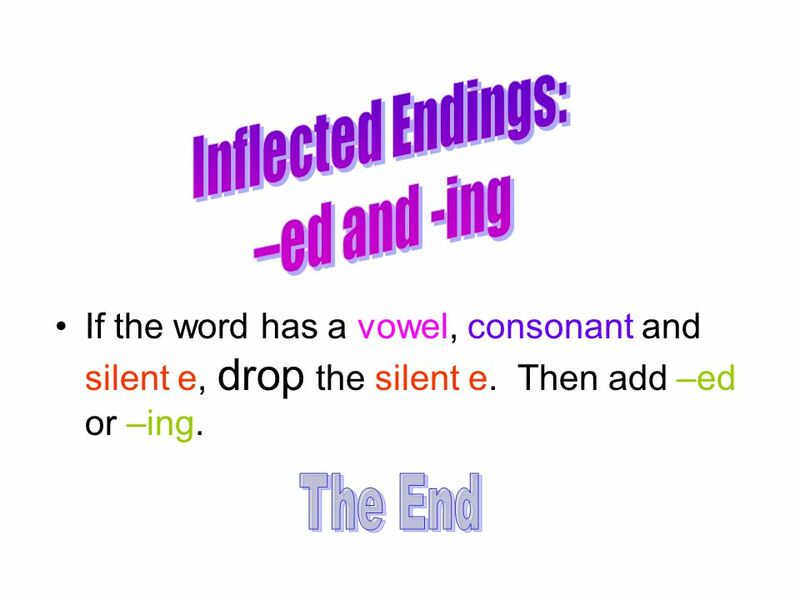 Download ppt "Vowel, Consonant and Silent e"
Word Endings Created by Randy Stark and Terry Day 1999 wanted going longer walked taking. Spelling Adding ‘ing’ to verbs. Spelling Rules 1 As a writer, you want to make sure your readers know exactly what you mean. Misspelled words can keep your readers from focusing on your. Week #3 Vocabulary. Roots (page 15L) BI = TWOMAL = BADBENE = GOOD Bicycling (v): an action done on two wheels Maliciously (adv): something done out of. Silent e wave How does the word end? silent e! 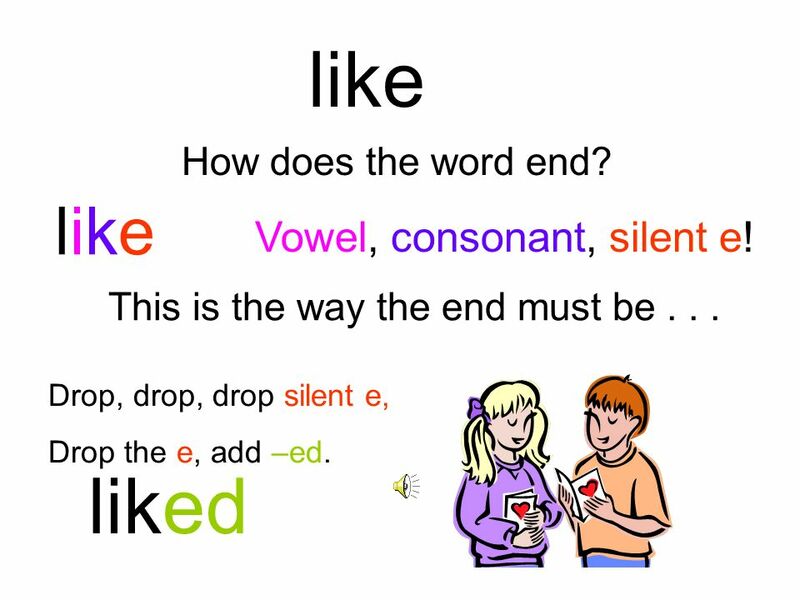 This is the way the end must be... wave Drop, drop, drop silent e, Drop the e, add –ing. waving. Word Mapping Strategy M ap the word parts A ttack the meaning of each part P redict the word’s meaning S ee if you’re right! 2009. 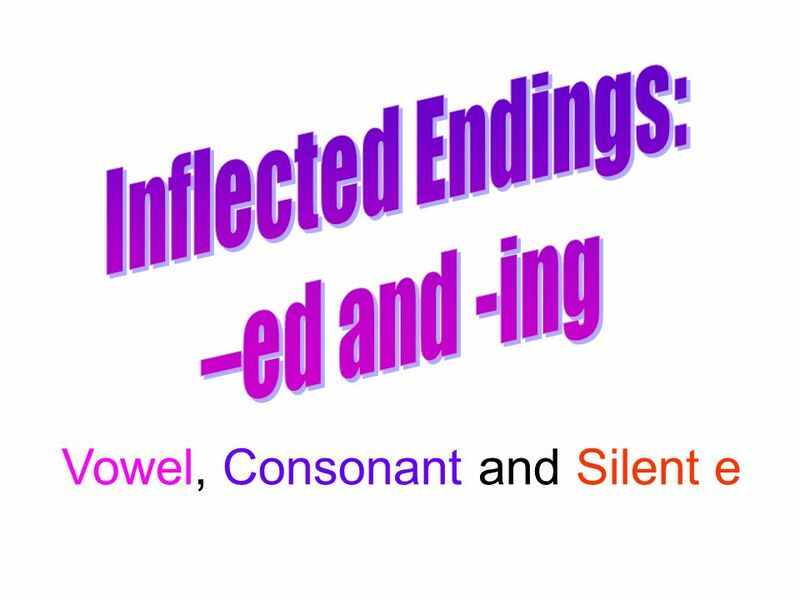 Long Vowels CVCe: a, i. pale What vowel do you hear? a take What vowel do you hear? a. 1 CHAPTER CONTENT. 2 CHAPTER CONTENT CHAPTER 2: PREVIEW Alada rides the bus to work. Yesterday it rained and her clothes got wet. Today she is taking.